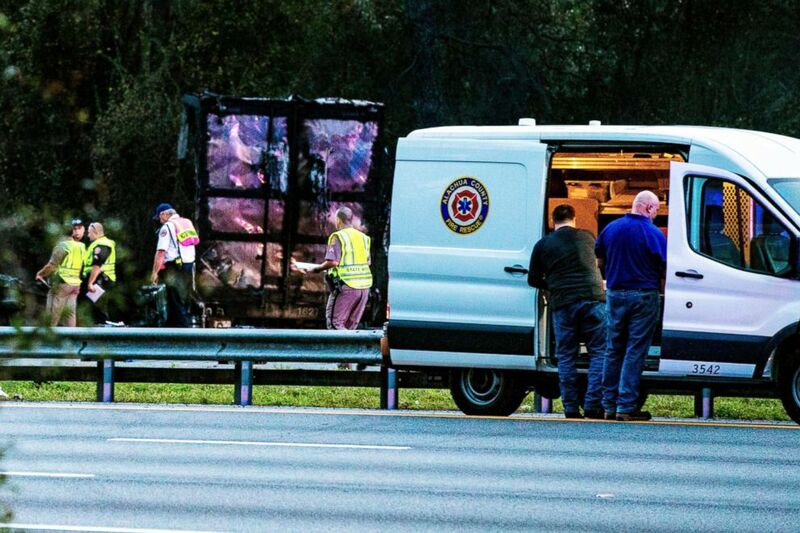 A church van from Louisiana was en route to Disney World when it became involved in a fiery, multi-car crash near Gainesville, Florida, leaving five children in the van dead, the church said. 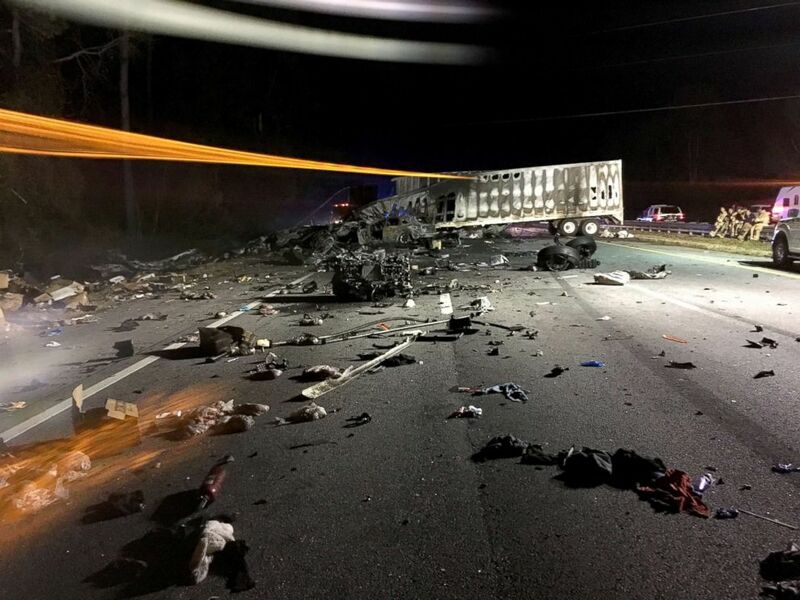 Besides the five children, two men driving two semi-trucks involved in the massive collision Thursday also died, the highway patrol said. Those men were Douglas Bolkema, 49, of Albuquerque, New Mexico, and Steve Holland, 59, of West Palm Beach, Florida. Nine children and three women, including a pregnant woman, were in the van from United Pentecostal Church in Marksville, Louisiana, said Kevin Cox, Louisiana District Superintendent for the United Pentecostal Church. 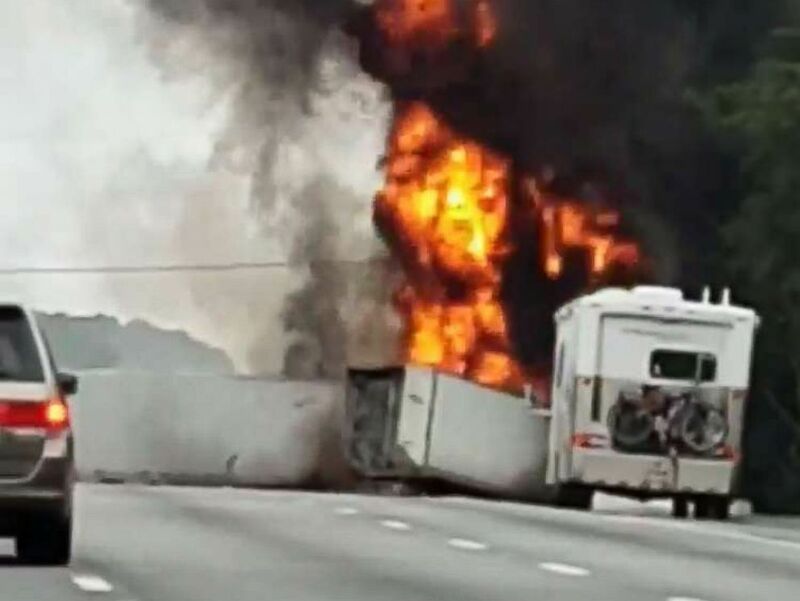 The police are still investigating a fiery crash where multiple people died and others were critically injured, Jan. 3, 2019, on I-75 near Gainesville, Florida. The pregnant woman survived and her pregnancy was stabilized, a pastor said, Friday evening. Church officials initially said the baby was successfully delivered after the crash, but updated their public statements later on Friday. Police survey the scene after a wreck with multiple fatalities on Interstate 75, south of Alachua, near Gainesville, Fa., Jan. 3, 2019. One of the five children who died was the granddaughter of a pastor, the church said. The deaths are considered traffic homicides, a highway patrol spokesperson said. Six to eight people were injured, officials said. The four surviving children were all injured but will likely recover, according to Cox. 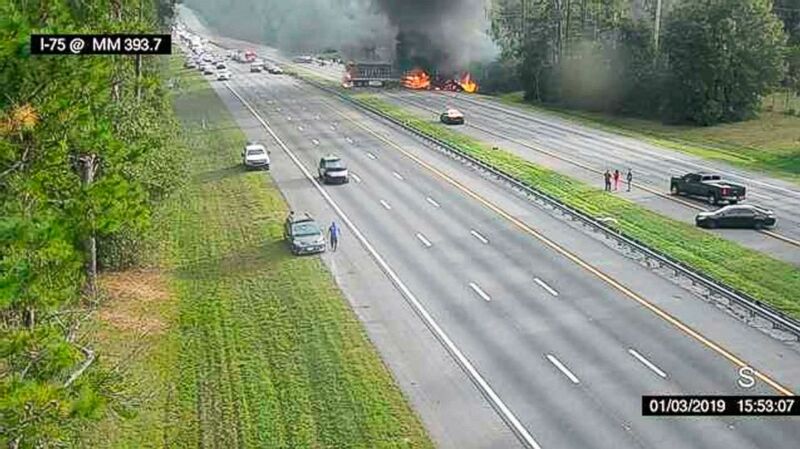 This image taken from a Florida 511 traffic camera and provided by the Alachua County Fire Rescue, shows a fiery crash along Interstate 75, about a mile south of Alachua, near Gainesville, Fla., Jan. 3, 2019. The crash unfolded when a semi-truck was heading north and collided with a northbound passenger car, the highway patrol said. After the collision, both cars went through the guardrail, into the center median and then into the southbound lanes, the highway patrol said. Heading southbound at the time was a passenger van and another semi-truck. When the semi-truck crossed into the southbound lanes, it crashed with the van and the southbound semi-truck, officials said. The van flipped over and some people were ejected, the highway patrol said. Mandi Lamonda was driving north when she "noticed some white smoke on the south side of 75." 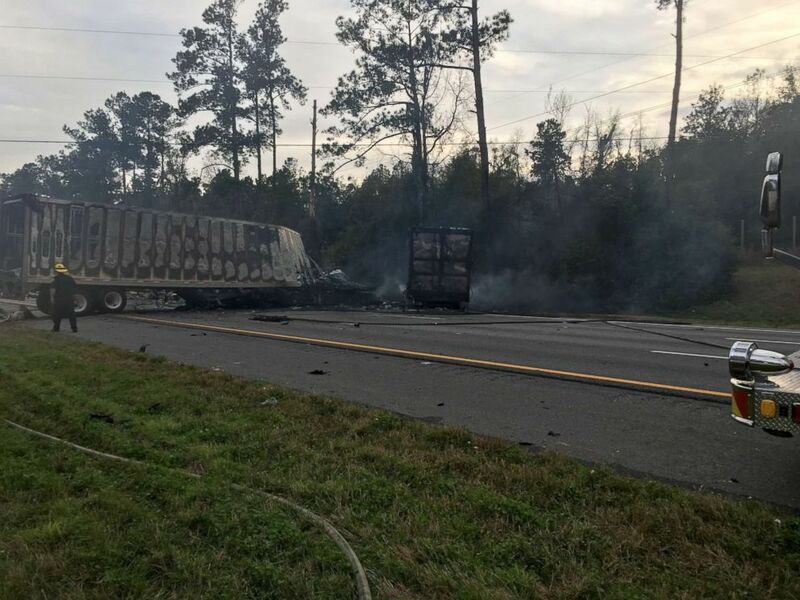 Fifty gallons of diesel fuel spilled in the crash, Alachua County Fire Rescue said, and both semi-trucks caught on fire. Cox in his statement urged people to "pray for the healing of those physical injuries. And, perhaps even more so, pray for that church family that has been so massively affected by this tragedy." Multiple people are dead and others critically hurt after a fiery car crash on I-75 near Gainesville, Florida, Jan. 3, 2019. Louisiana Gov. John Bel Edwards said his heart goes out to all of the church members impacted by the tragedy. "I hope you will join your prayers to mine as these families face the difficult days ahead," he wrote on Facebook. It is unclear if investigators from the National Transportation Safety Board (NTSB) will head to the scene of the crash. Most employees there are furloughed as a result of the partial government shutdown. Officials with Florida Highway Patrol told ABC News it has shared information about the crash with the NTSB but no federal investigators have been involved in the probe. Before the shutdown, NTSB officials told ABC News that existing investigations would be put on hold and new investigations would not be launched until the shutdown ended. If an accident occurred with a significant amount of casualties and presented a substantial danger to the traveling public if not responded to immediately, an investigation may be launched. ABC News' Fergal Gallagher, Barbara Schmitt and Marissa Parra contributed to this report.